With a history of pop music success, including multiple Eurovision Song Contest victories, perhaps no country embraces reality song competitions like Sweden. One good example is the well-known Idol franchise, which has been one of the most popular shows on Swedish television since debuting in 2004. The twelfth Swedish Idol season started airing on TV4 in August 2016 with a finale show held December 8th at the Ericsson Globe Arena in Stockholm. 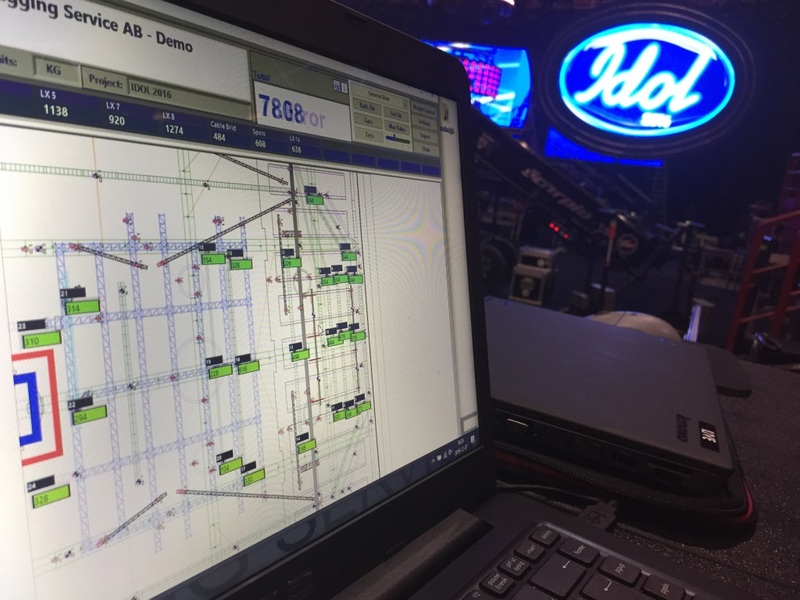 Scandinavian Rigging Service (SRS) has worked on each Swedish Idol Final for the last 10 years, and this year was responsible for the complete rigging from drawings and weight calculations to top rigging supply and rigging personnel. 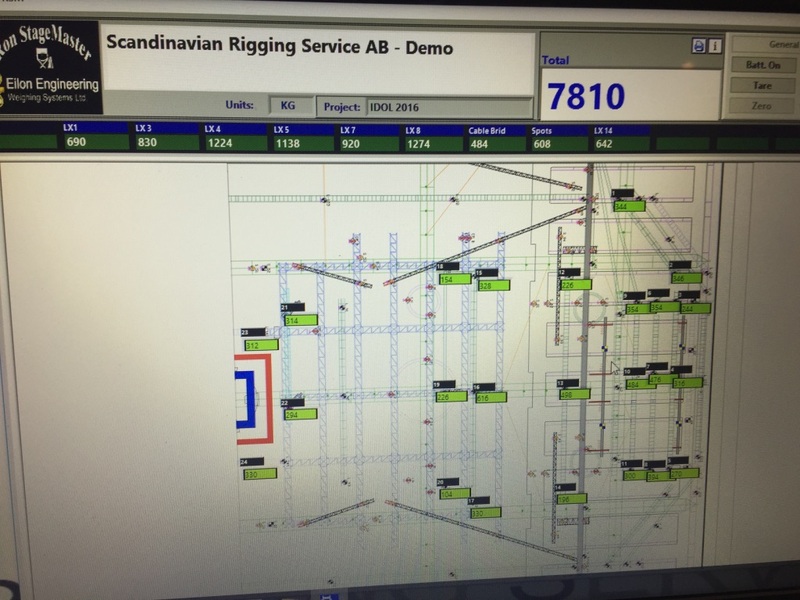 New this year however was the use of Eilon Engineering’s Ron StageMaster load cells to monitor the rig’s weight and distribution. 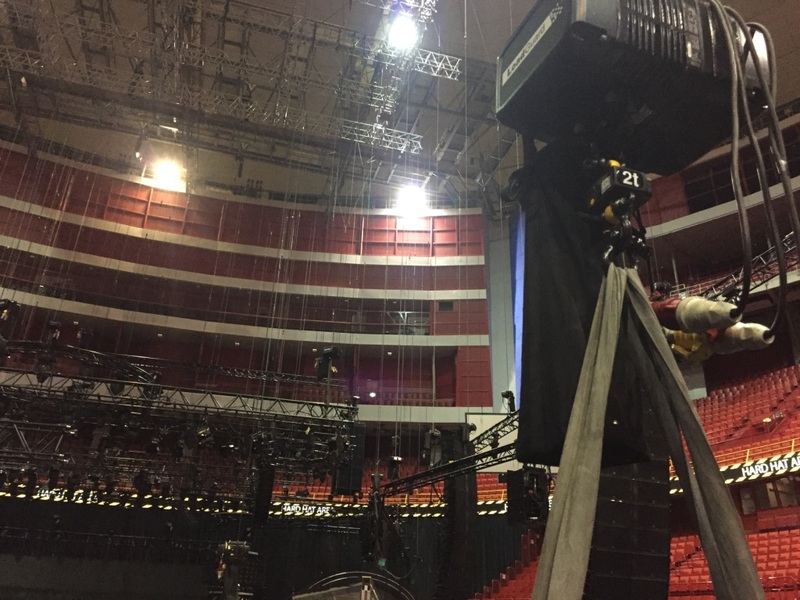 As the ceiling in the Globe is quite high, approximately 35m, Sören wanted to place all load cells above the hoist in order to get everything controlled. “It was important that the system was live, direct and wireless, otherwise we could not have put the load cell above the hoist, which was at 24m,” he explains. 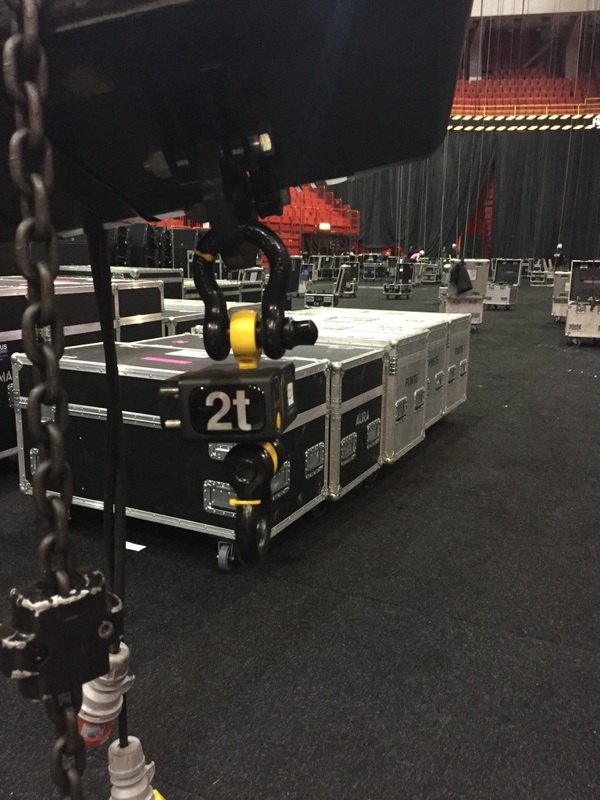 “Wired was not an option because it was 11 meters down to the hoist.” Sören explains that because all hoists used on the show were from another supplier, he didn’t know what type he would be getting and therefore didn’t know the exact spec beforehand. Used to monitor the setup were 24 Ron StageMaster 6000™ G4 wireless load cells run using one CRR and a PC and one PRR with an iPad. In this wireless system, load cells transmit via radio frequency to the Ron StageMaster PRR (Portable Radio Receiver) - a hand-held Bluetooth-compatible load monitoring system for which you simply download the app to a tablet or smartphone. The PRR can monitor up to 40 individual load cells from a single screen and any location. The stationary desk-top version is based on a CRR (Central Radio Receiver) that monitors up to 200 load cells. The quick-to-install plug-and-play system is extremely convenient for riggers, simple to operate, eliminates messy cabling, and has an extremely short response time. 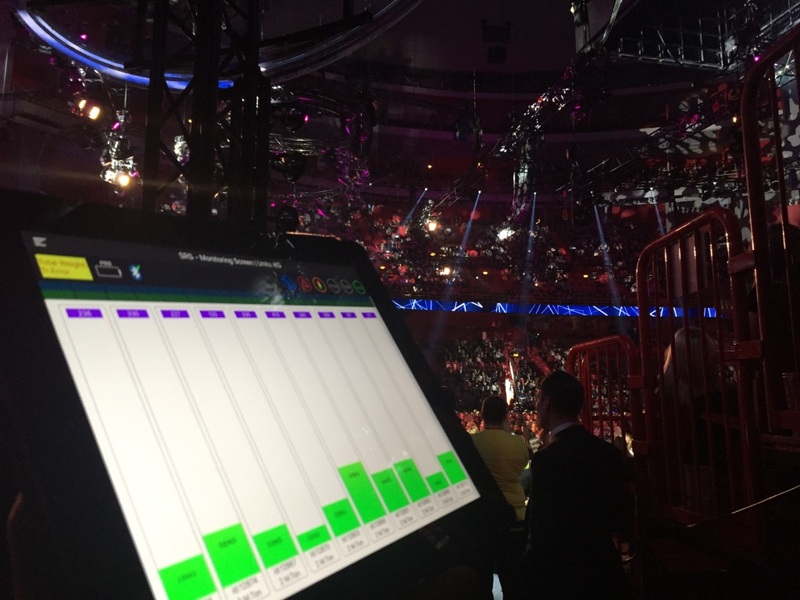 Sören was able to live monitor the setup’s six video walls in order to not overload the house grid where the main PA was also hanging. “Knowing that the calculation was right was absolutely necessary and with load cells you know exactly what hangs there,” he stated. “If I get a wrong number from somewhere, a wrong spec for example, it doesn’t matter. 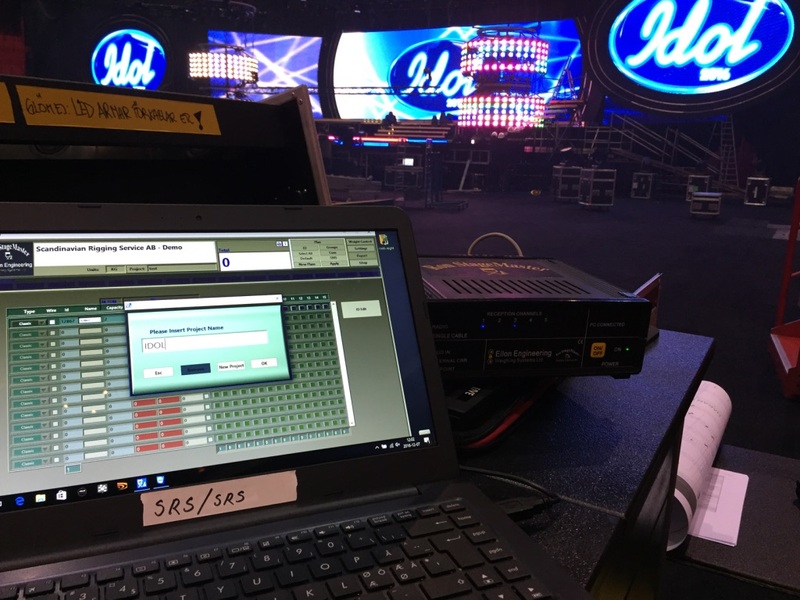 It eliminates the human error, makes my work much safer and is safer for everyone.” He adds that using load cells is also good for his relationship with the venue. Used to monitor the rig for any unexpected shifts in weight from setup to tear down, the Ron StageMaster 6000 G4 load cells provided a level of comfort for everyone involved in the show. By using the safety device, Sören both reduced exposure and minimized liability. Made of aerospace quality, high-strength alloy steel, the Ron StageMaster 6000 G4, like all Eilon Engineering load cells, is fatigue rated to withstand unlimited load cycles without the risk of failure or damage. The Ron StageMaster system can continuously monitor a rig up to 5000 hours, and contains absolutely no standby or sleep modes, which are risky and unacceptable from a safety perspective. The Ron StageMaster system monitors the load 24/7 and has a transmission range of up to several kilometers (optional). See Eilon Engineering at the Prolight + Sound show in Frankfurt April 4-7 on Stand 3.0 E21 (Cast).